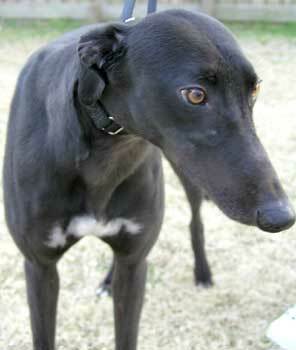 Sandi, aka Melisandi, is a beautiful, almost 2 year old, black female, born March 17, 2002. Her sire is Solitary Runner, her dam is Erin Darnell, and her grand sire is HB's Commander. Only 9 races constitute her racing career from October 11 to November 29, 2003, and here she is racing for her forever home! Sandi is very loving and affectionate - and she is one of those who is a "Leaner"! 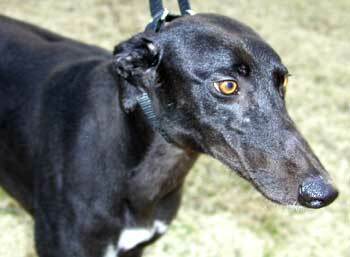 It is not known at this time if Sandi is small animal or cat tolerant, but is in a foster home with other greyhounds.